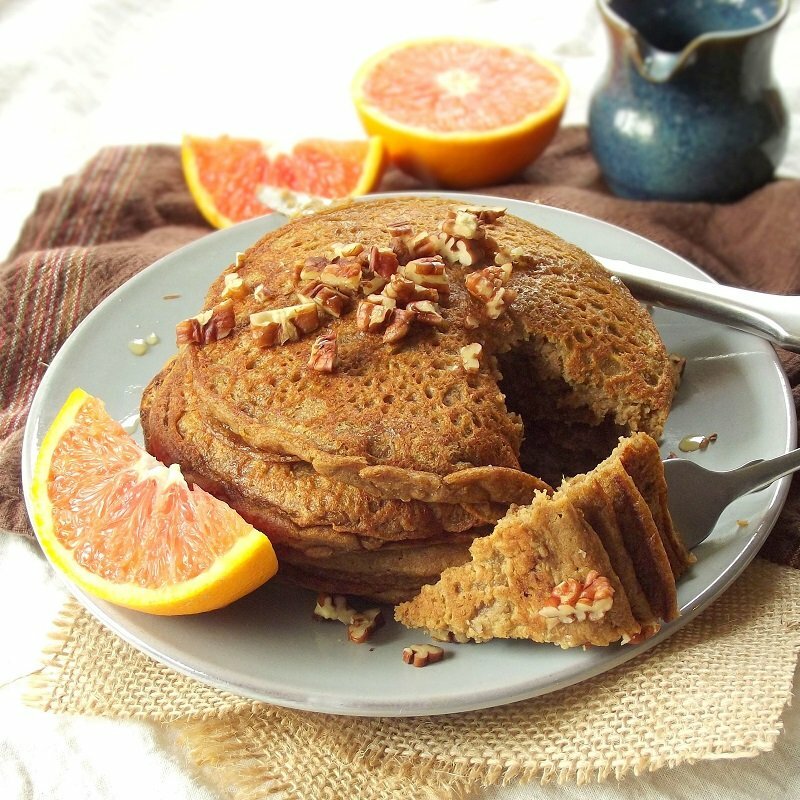 These vegan sweet potato pancakes are incredibly rich and flavorful, made a hint of cinnamon and nutmeg, and are topped with orange infused maple syrup. A friend invited me out to brunch. She raved about this new place in her neighborhood. “They have sweet potato pancakes!! !” she exclaimed. She knows I’m not into eggs. 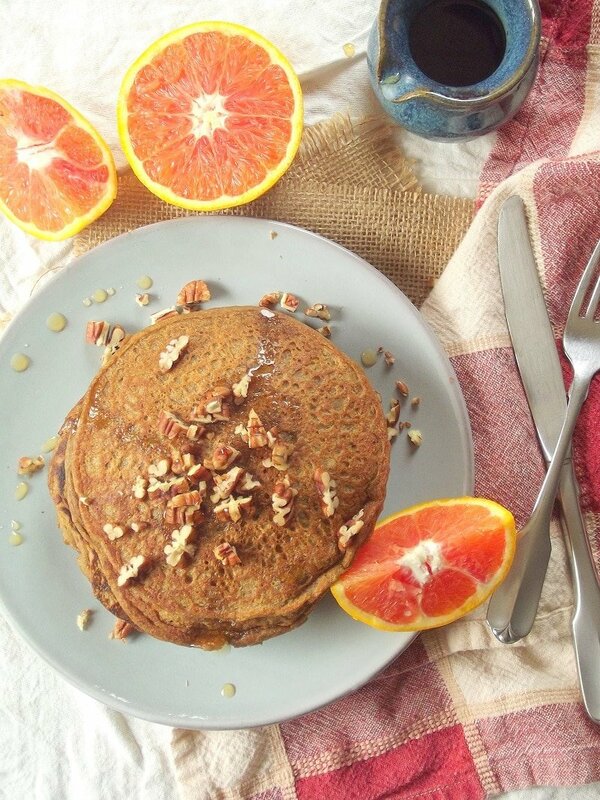 Sweet potato pancakes! I was psyched! “Do you think they are batter based pancakes, and they mash up the sweet potato and add it to the batter, like pumpkin pancakes? Or do you think they are like potato pancakes, all shredded in fried patties? !” Either option would be DELICIOUS! Fast forward to Saturday morning. I order the sweet potato pancakes. I don’t ask the server what to expect, as I want this to be a surprise. The cakes arrive, and I was surprised to discover that they were flapjack style pancakes, with a few chunks of sweet potato mixed in the batter and a few sprinkled on top. Now, they were delicious. 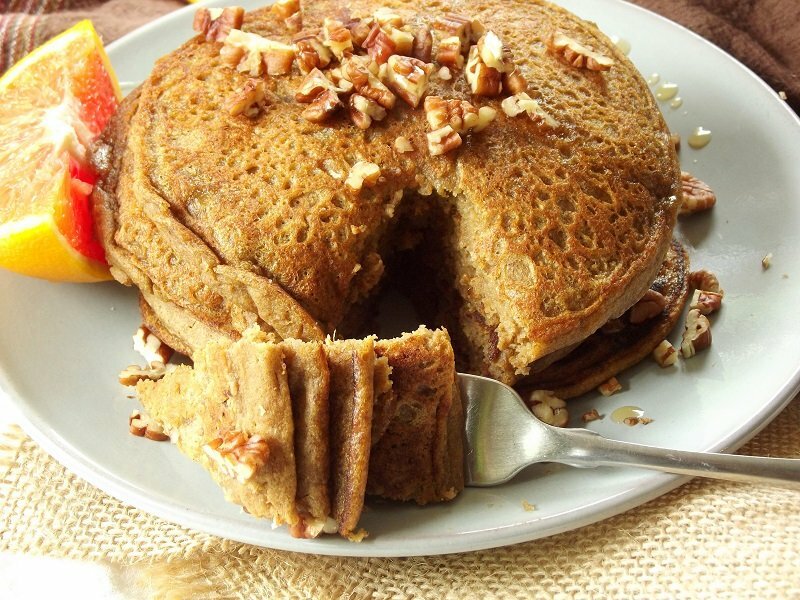 I mean sweet potatoes are delicious…pancakes are delicious…so you really can’t go wrong. In hindsight I’m not sure why I thought they would be anything different. I mean, when you order banana pancakes, blueberry pancakes, or any other variation on the [insert plant food here] pancakes theme, you basically get chunks of that item mixed in and sprinkled on to of your pancakes. Anyhow, I took the experience as a cue to create my own sweet potato pancakes based on my two anticipated varieties at brunch. In truth, was more excited about the sweet potato in the batter embodiment, so I tried that one first. I’m happy I did, because it turned out fantastic. I actually made two attempts at this and I’m glad I did. The first attempt had a little too much flour and ended up being just a tad bit dry and chewy, as well as lacking in the sweet potato flavor I’d been looking for. After eating pancakes from that batch I felt really full and heavy. I made another attempt the next morning using less flour. They were perfect. Moist, delicious, sweet potatoey perfection. The inspiration from the orange infused maple syrup came from my mom’s thanksgiving sweet potatoes, which include orange juice and are superb. 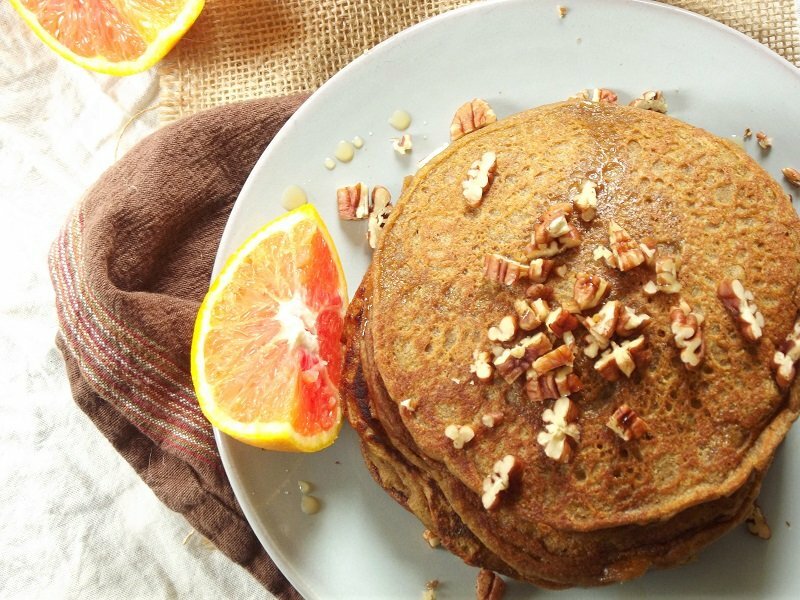 One other great thing about sweet potato flapjack style pancakes: sweet potatoes work great as egg substitutes, which means that these pancakes are vegan! Heat all ingredients in small saucepan and bring to a low boil. Lower heat and simmer about ten minutes, or longer to get a slightly thicker syrup. You can prepare your pancakes while the syrup simmers. Mix sweet potato, milk, coconut oil and maple syrup in medium mixing bowl. Mix flour, baking powder, salt, cinnamon and nutmeg in a separate, large mixing bowl. Add liquid ingredients to dry. Mix until just blended. Heat griddle or skillet over medium heat and coat with oil or cooking spray. Pour 1/3 to 1/2 cup batter onto heated surface. Cook until browned on each side, about 5 minutes per side, flipping very gently between sides. My my my. Aren’t I happy that I found your beautiful bloggity blog. And this recipe looks just delicious. Hello! Hey, thanks so much! The pancakes did turn out great :) You’re actually my first comment as a new blogger (and here I thought it would come from my mom). Totally appreciated. Yay! Glad to hear it! Thanks Leslie! I haven’t frozen these particular pancakes, but most are good for about 3 months in the freezer. I usually layer a few pancakes with parchment paper in between, and then place the whole stack in a freezer bag. Enjoy! !